New thread for new forum. Are we going to move all the threads back onto these forums, like the CT Discussion Thread, Boss Discussion Thread, etc.? It's ok. We'll assume it was during the time of round 2 MOABs and white popping Snap Freeze and call it good. That time also reminds me of when I thought dartlings were the best tower at the time. Oh the mistakes that were made. I still utilize dartlings aplenty on River Crossing, due to them comparing to buccaneers in attack as well as range and control. As for River tiles, I just spam dartlings. Maybe it's not the best strategy, but it works for me. 0/0 Dartlings are actually quite good with Monkey Knowledge. Found a Bounty Card after who knows how many packs. It was Red Hot Spikes. Meh. They could probably help in a pinch. City cash bounties are some of the worst bounties. Even more useless than red-hot spikes. What kind of bounties are there again? 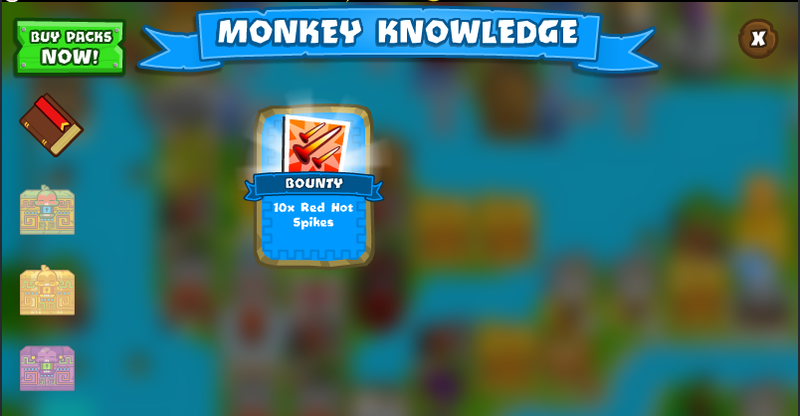 Spikes, crates, city cash, Monkey Secrets, wild card packs, ancient packs, regular monkey packs, boss abilities, bloonstones, monkey boosts.